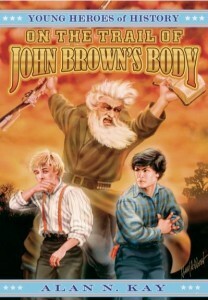 John Adams (George’s abolitionist uncle and David’s father) is on his way to join the mysterious John Brown and after a long chase, George and his father Sean have finally caught up to him. Sean is trying to convince his brother John that what he is doing is wrong. “But hundreds, maybe thousands will be killed,” Sean pleaded. John stopped and thought for just a moment. John got up on his horse suddenly and began to turn it away. John ignored his brother’s pleas and turned his horse onto the road. In an instant, Sean jumped on his horse as well and gave chase. George ran out of the bushes from where he was watching. “Wait Dad wait!” He yelled. George looked around. There certainly was no one around and nowhere to get help. He looked ahead again at his father and Uncle. They were already turning the corner and racing down the road. George jumped on his horse to follow. “I’ll listen no more,” John shouted back as he whipped the reigns of his horse again to make it speed up. Sean looked ahead. He couldn’t let this go on forever. He looked down. The road was getting tighter as it made its way through the Appalachian mountains. They climbed higher and higher. Sean could see the cliffs and rocks below. He had to do something soon. “Yee-hah!” he yelled as he whipped the horses reigns one more time. Sean’s horse was not weighted down with equipment as his brother’s was and within a few minutes the distance between them was almost gone. Sean loosened his feet out of the saddle and climbed onto the back of the horse. “What are you doing?” John said suddenly, turning to see his brother right next to him. “Raaaarrr,” Sean yelled as he jumped off his horse and onto the mane of John’s. The impact knocked both of them off of the horse and onto the road. “You crazy fool,” John yelled at his brother as he struggled to get up. “You made me do it,” Sean yelled back, turning towards his brother. “Arrgghh,” Sean screamed as he tried to stand. He looked down to see his leg all twisted from the fall. It felt like a hot knife had suddenly been thrown into his leg but he still managed to slowly stand and back away from the furious John. “I’m not going to let you stop me,” John warned as he started towards his limping brother. Sean backed away. He looked up the road. The horses had already disappeared around the bend. He looked back. George was only now coming into view. He steadied himself for the fight about to come.